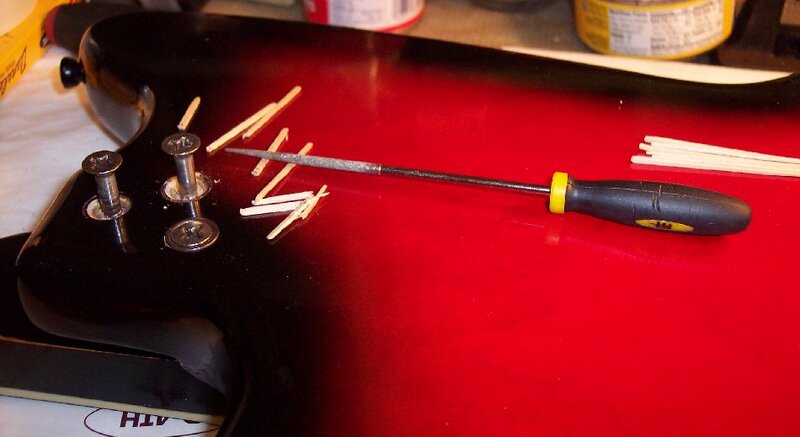 It is quite common to need to tighten up vintage guitar screw holes for any number of reasons the holes can become loose or otherwise insufficient for a good tight fit for it's screws. In this guitar's case it's neck could be forced to move laterally in it's neck pocket, ....and since I had already refurbished it's neck heel screw holes, then it was obvious that it was the neck pocket screw holes that needed a refurbishment too. 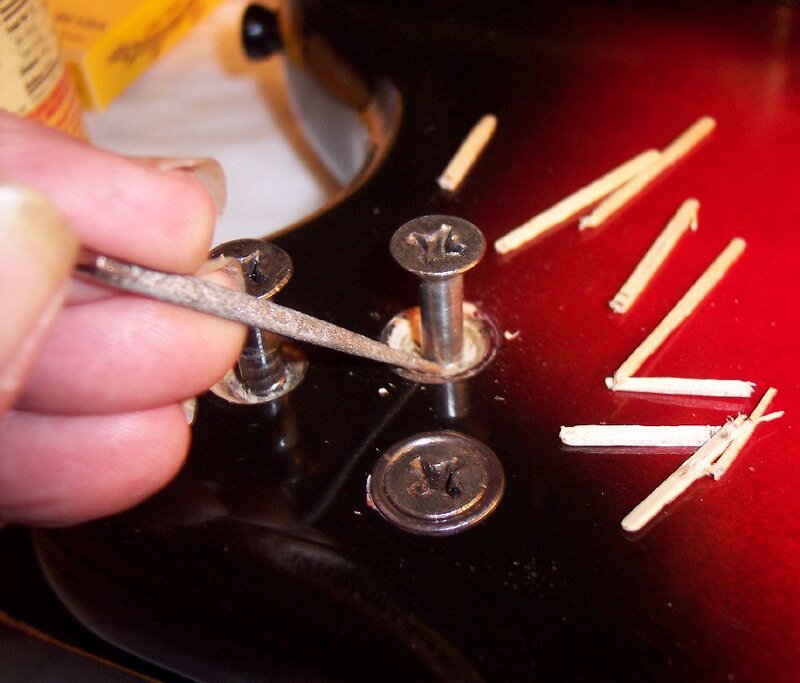 To set the toothpicks, slowly tighten the screw until it's threads reach the bottom of the hole, noticeable in this case by feeling the threads reach the neck heel. Then break the toothpicks off with bending motions in all directions. Now take out a small rat-tail file or similar tool (even a nail will work) to remove the burrs from the broken-off ends of the toothpicks. I like a diamond-dust file. The tip of the file is used to "sand" down the burrs nice and even. This will prevent the burrs from interferring with a good tight seat of the counter-sink washers and screw head. NOTICE: The screws shown above are not the original screws for this guitar; They are the screws that were on the neck replacement donor guitar, and are 1.5" long (correct for the donor guitar's 1967 vintage / run screw holes depth) but incorrect for the better 1.75" screws used on this / earlier (1965) same model run. 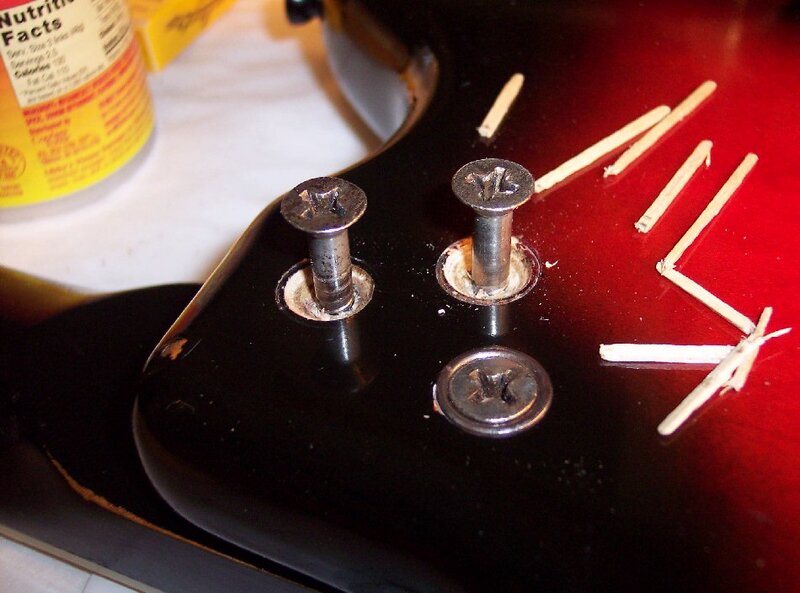 The screw heads for THIS guitar were industry soft and wallowed out so I used the donor screws of the same diameter and pitch to rehab the scew holes; Then upon final assembly I replaced the original screws with fresh NON-STAINLESS screws. 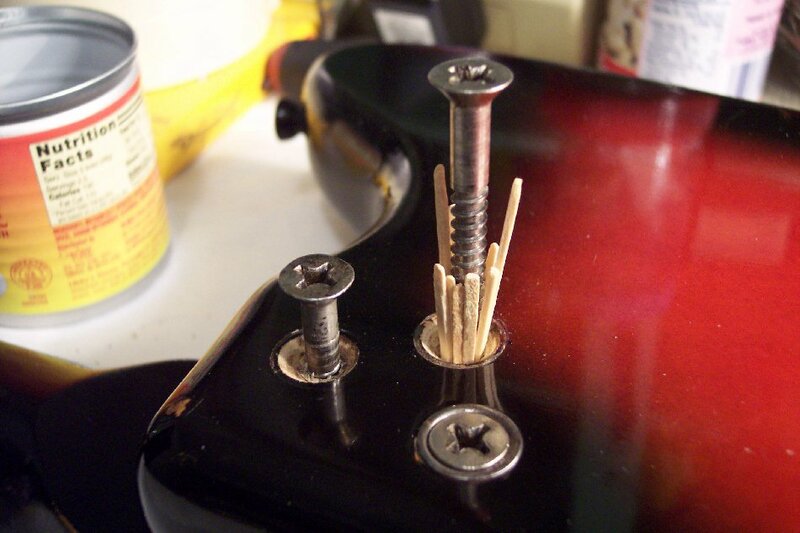 I could not find STAINLESS STEEL screws like the original screws were, at any source locally, ....nor did I want to hold up progress on this guitar searching and acquiring them mail-order. Standard / common size stainless steel wood screws are 1.5" or 2.0" ....with 1.75" not commonly stocked. I feel sure that 1.75" stainless steel screws exist somewhere here locally, but I could not find a source. IF stainless steel screws are desired, they should be available at fastener supply houses in or near a large city such as London, or elsewhere by mail-order at specialty fastener sources. I HIGHLY SUGGEST acquiring THE HARDEST GRADE of stainless steel screws of the same kind, diameter, and pitch that they have or can acquire. Also note that the non-stainless screws I used could be nominally coated with clear fingernail polish to protect them against corrosion; But any type of oil should not be used for same because the oil will seep down into the screw holes wood and weaken it (turn it to mush over time).